An unusual memoir by a professional actress in Ghetto Theresienstadt. Vlasta Schönová, or Vava as she was known, began her theater career as a teenager before the Nazis occupied Czechoslovakia. For a while, she was able to continue acting by passing as a non-Jew. After her deportation to Terezín, she performed, directed and wrote plays as a prisoner. Theater, she writes, invested her life with meaning and kept her alive, even in the most deadly circumstances. Based on a notebook the actress kept, Acting in Terezín is translated from the Czech by Vava's cousin, Helen Epstein, author of Children of the Holocaust and Where She Came From. It features seven extraordinary theater posters from the Terezín Memorial's collection. Acting in Terezín is excerpted from Vlasta Schönová's memoir Chtěla jsem být herečkou (I Wanted to be An Actress), published in Prague in 1993. 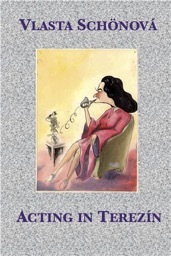 A Hebrew edition was published in Israel in 1991 as Lehiyot Sachkanit (To Be an Actress) and translated into English by Michelle Fram Cohen (Hamilton Books, 2010). Both books describe Vava's life before the war in Prague, and after the war in Israel.